Ever since I came back from Japan I hardly got any time to practice my green fingers. The seeds that I brought from there is sitting in the drawer for their turn in the sunlight, but with my health and so many other works life is just not the same anymore. With the house being far from how I would like it to be, every now and then I suffer from guilt pangs to not have sufficient energy to work on it. My family has always taught me to prioritize my responsibilities but those green things growing in my tiny verandah definitely gives me a joy to kickstart a wonderful day. I miss my fingers touching the soil, that very smell of soft sunrays falling on the wet soil or the twinkle in my son’s eyes when he picks cherry tomatoes and shouts ‘Mummum today we got 5 tompies”. But that does not stop us from eating homegrown organic veggies. 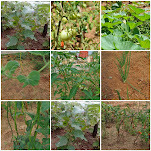 My mother the avid gardener of the family keeps sending all types of fresh greens, veggies and fruits from her garden. All three of us Being big veggie eaters, I love cooking with those fresh juicy vegetables. Nothing to compare even to the pricey organic veggies from the store. Yet there are days when you open your fridge and see empty vegetable trays and wonder what to cook for dinner. Potatoes, eggs, soy chunks, papads etc could be a life saver for such nights and there definitely are certain recipes that you need to have in your repertoire to save yourself on such occasions. 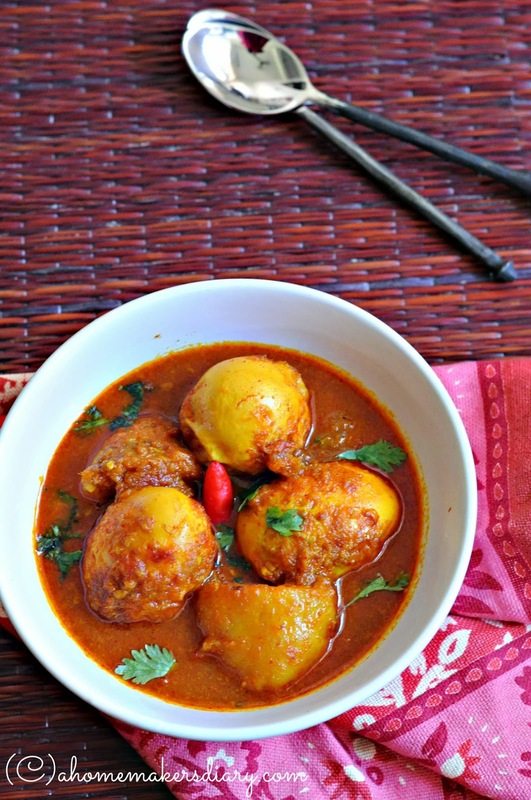 This Bengali Egg curry fits that bill perfectly. Its all housewives answer to an empty pantry, busy weeknights and fussy eaters. All you need are the regular spices and veggies that keep well for longer period of time. The best part is eggs being a crowd pleaser and easy to cook you can even prepare dinner under 30 minutes. Use both your burners to cook rice or roti, chop up a kachumbar salad, accompany the meal with some roasted papad or pickle and you are ready to have a scrumptious, wholesome meal almost in no time. 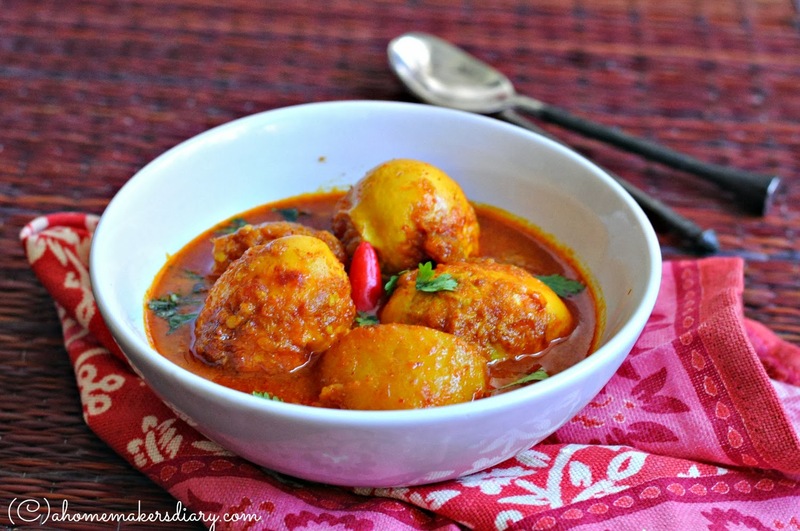 Though this is called Bengali egg curry but this has some colonial reference. 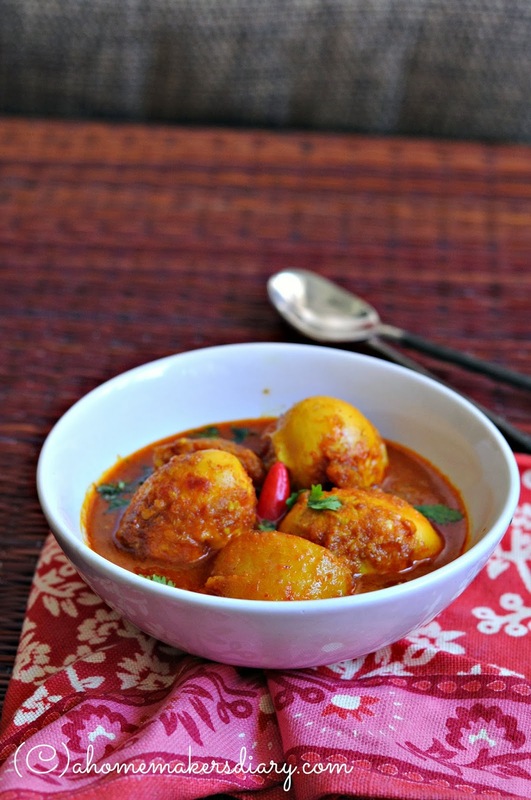 Egg or chicken was never considered a staple in any Bengali kitchen, No, not even a few decades back. I still remember my father’s elder Aunt vigorously shaking her head and denying anything to do with chicken getting cooked in the house. Though mutton or goat meat has always been welcome but till date some relatives related to my in laws cooks cheken or egg in an outside kitchen. I being an obvious egg lover and wife and mother of two more members definetly has many reason to Thank the British for this delectable egg curry which we Bengalised ( a new term indeed J) with time. Wash and cut the potato in quarters. Boil the eggs and potatoes with a pinch of salt till the potato is cooked through. Drain the water and let it cool down in fresh cold water for 5-7 minutes. Peel carefully without breaking the white part and with a sharp knife make 3-4 cut marks on the eggs. Sprinkle salt and turmeric on both and keep aside. Heat the oil and fry the potatoes and eggs till golden. Take out with a slotted spatula and keep aside. Temper the same oil with the whole spices (lightly bruised to release the aroma). Once they start to splutter add the onion paste. Fry on low heat for 5 minutes or till you see oil oozing out from the onion. Mix in the ginger garlic paste and cook for another 2-3 minutes. Mix in the coriander and chili powder in 1 tbsp water and add in next, cook for 30 seconds and then add chopped tomato and little salt. Cover and cook till the tomato is soft and mushy. With your spatula mix the tomato to the spice paste to get a smooth consistency. Cook for a minute and then add the eggs and potatoes. Give it a good mix and then pour in 11/2 cups of water. Check the salt and adjust as per taste. Cover and let it simmer for 5-6 minutes till the eggs and potatoes takes on the flavour and taste nicely. 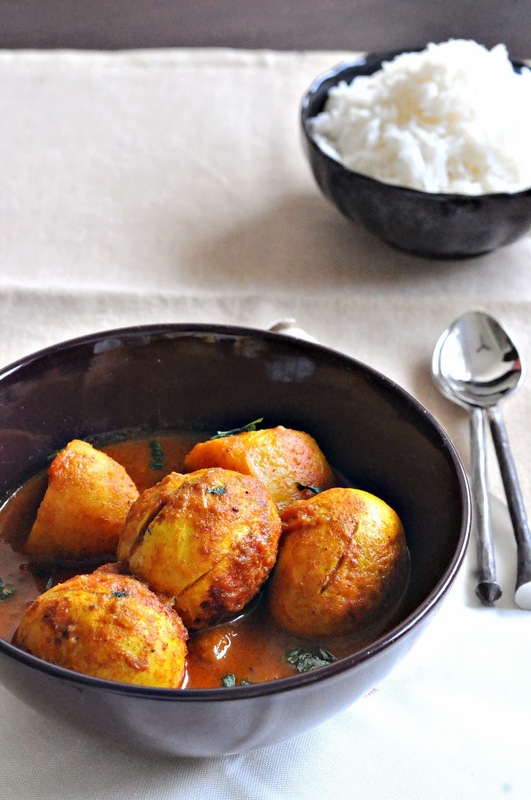 Sprinkle chopped coriander or garam masala powder and serve hot with steamed rice or roti or paratha. Please adjust the heat and the water as per your liking. Potato and eggcurry looks delicious. 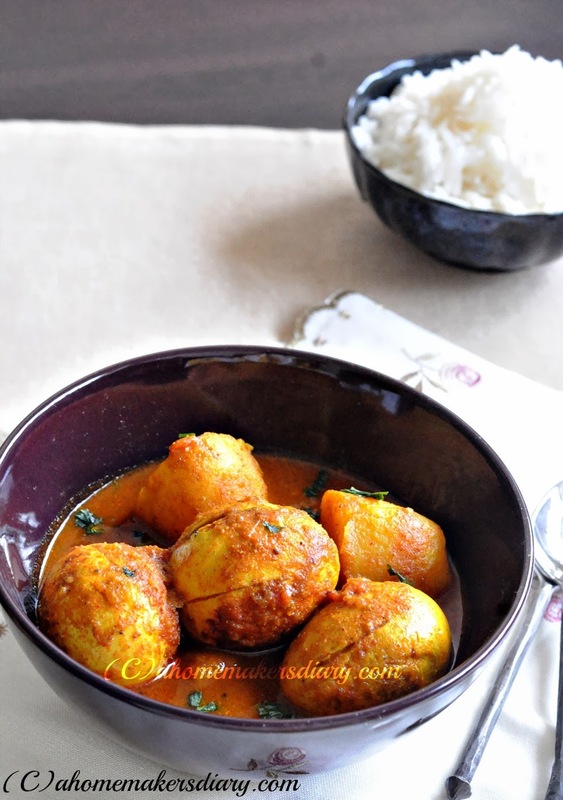 I have a bengali friend who used to make it. Wow.Loved the curry and the presentation. Dimer dalma dekhe jibe jol eshe gache. 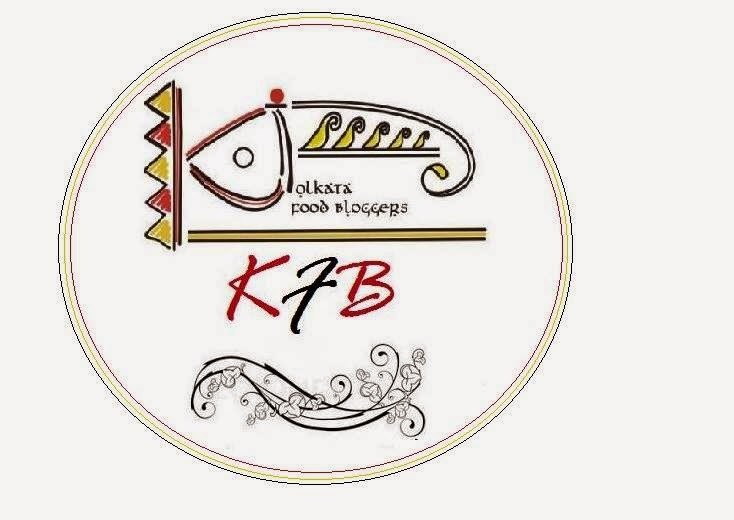 Khub khete icche korche. Pics are wonderful. 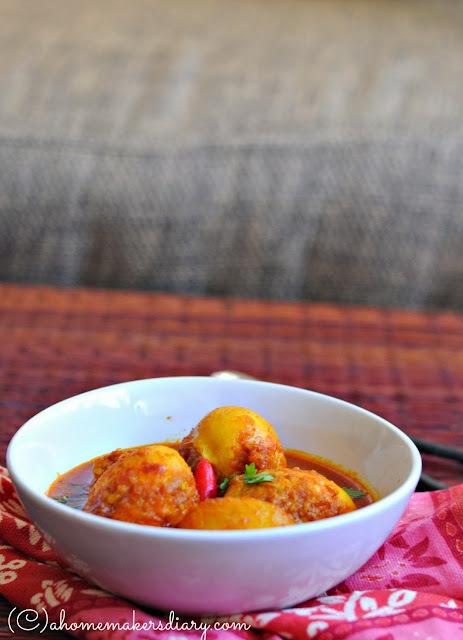 Omg, the colour of the dish is just breath taking, mouthwatering here..Fingerlicking curry definitely. Potato and Egg is a nice combination.. 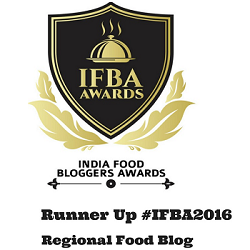 Delicious.. First time on your blog.. Really loved your header design..
As an expatriate from Britain living in rural Spain I do miss curry. I am going to make this tonight.